I reheated after casing to nearly steaming when I loaded up the press. I couldn't resist cutting off a hunk of it and lighting it up... it is magical. It's somewhere in between Lane and Sutliff RR. I am really glad I added the molasses, as it really makes this taste nice and rich. I think pressing probably cut the burn rate in half too, which I am happy about. I think next on the list is going to be a 50/50 mix of White Burley/ and home toasted white burley maybe with a little anise seed added to the boil when I make the casing. This is seriously fun. I'm a fan of anise too. Great flavor with a burley. I need to get my casing game on track instead of just throwing the dice on everything. I figured out a few things when I was doing mine. 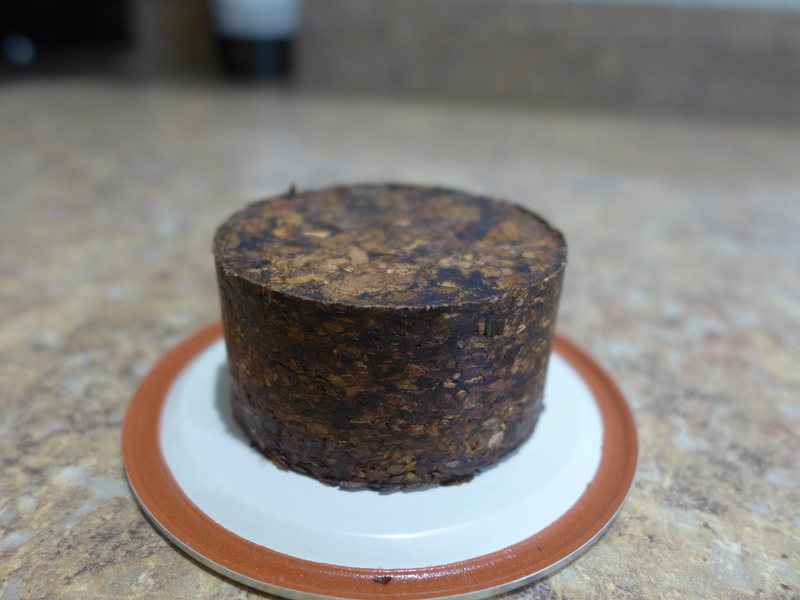 I chose to only make a pint, as even that will stretch to about 25 lbs of tobacco.. I also figured out that if you are mixing sugar and water at a 1:1 ratio by weight, it comes out pretty easy. A pint of water weighs ~1 lb, and 2 cups of granulated white sugar is also ~1lb. It also helps to have a syringe in ml to measure casing, and one of those tiny little travel misters, so you aren't foolin around trying to spray 4ml of casing out of a full sized spray bottle. I ended up adding a little extra water to the mister once I had pumped it dry to get all the casing out and compensate for moisture loss in my second heating before going to the press. It seemed like it worked out pretty well. I was going to wait until tomorrow to take this one out of the press but I wanted to clean up the mess it was making. Impatience played a role as well. 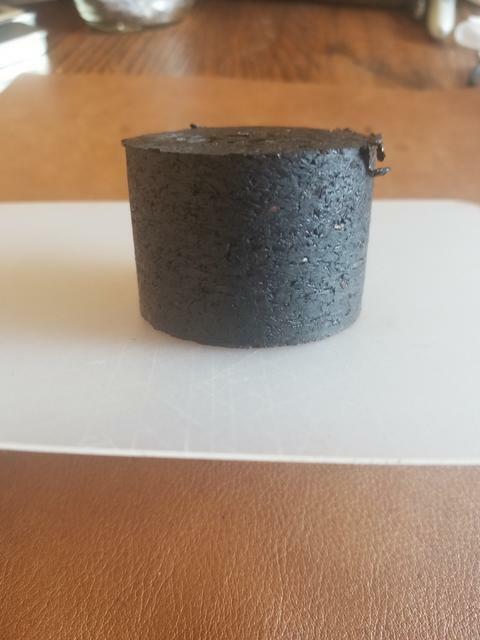 Holy moly.. that thing looks like a charcoal briquette! 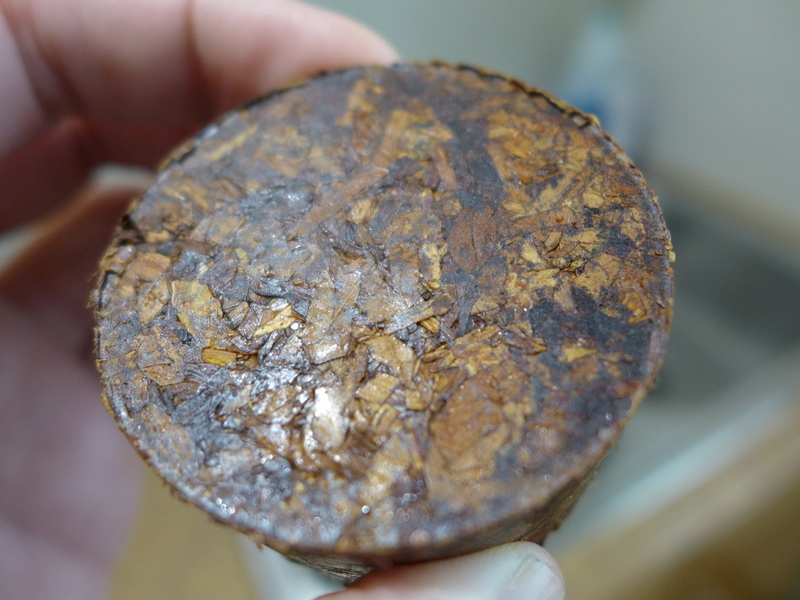 Looks like plug chewing tobacco of old . . . The Houtencake did slacken a little over night. I could still cut a flake off of it, but it is not a total brick. I kinda hope it slackens a tad bit more so I can tear chunks off like a proper crumble cake.